The RMS Caronia owes her very existence to the foresight of Sir Percy Bates, the Chairman of the Cunard Steamship Company. Considering the company’s extreme success during his tenure and beyond, one could make a strong argument that Bates was a genius. The depression had nearly ruined trans-Atlantic shipping, but under Bates’s skillful leadership, Cunard once again rose to dominate the North Atlantic. Taking the helm of the company at a crucial crossroads, including the onset of the Depression, his strong hand guided the company through the merger with their former rival White Star and the Second World War. His skill set the stage for the most prosperous period the company had ever known. His unexpected death in 1946, however, left a void of talent within the corporation that wasn’t filled for nearly 20 years. Caronia was the last ship Bates oversaw from her inception, and although Caronia was similar in size and speed to the successful second Mauretania of a decade earlier, Bates made sure that her role for the company would be unique indeed. Caronia was a ship of many “firsts” within the Cunard fleet, showing the care and attention that had been lavished upon her design by many of the greatest minds in the shipping industry. She was Cunard’s first large two-class ship. During her service on the Atlantic run, her passengers were divided into First and Cabin class. On her many cruises, however, Caronia was converted into a single-class ship and an extremely luxurious one at that. She was also the first with private bathrooms for each cabin, quite an astonishing feature for the time when many first-class passengers on smaller, older ship still had to walk down the hallway to use the facilities. She was also the first to have a permanent outdoor swimming pool, a necessity for her cruise role in warmer climates. She offered her passengers hot and cold running water in every cabin—both fresh and salt—an unheard of luxury. Finally she had one of the highest passenger to crew ratios ever for a cruise ship, meaning that her service was unexcelled. Many of these amenities seemed quite extravagant for the time, but in her role as the world’s foremost cruise ship, she had to feel like a home away from home for the rich and famous who sailed with Cunard and who expected nothing but the best. In fact, many of the amenities we take for granted today on modern cruise ships were instituted by Cunard on Caronia. The ship’s cruise passenger-to-crew ratio was amazing, nearly one-to-one, and the attention to detail by the staff was legendary. Cunard would fly fresh milk or lobsters to meet the ship in exotic ports. The service was such that several passengers opted to live onboard year round. Mrs. Clara MacBeth, for example, lived aboard for 15 years, spending $20 million in fares. Like clockwork, Caronia would follow a similar pattern. The opening months of each year would find her circumnavigating the globe or making a loop around Africa. After completing one of these long winter cruises, Caronia would embark on spring voyages to the Mediterranean and Black Sea and spend her summer in Scandinavia and on the Atlantic. Fall in the Caribbean topped off the year. Perhaps the highlight of Caronia’s career was her Coronation Cruise in May, 1953. After the untimely death of her father King George VI, a young Princess Elizabeth was to become the first British queen since Victoria over 50 years before. To her subjects, this was a great cause for celebration. 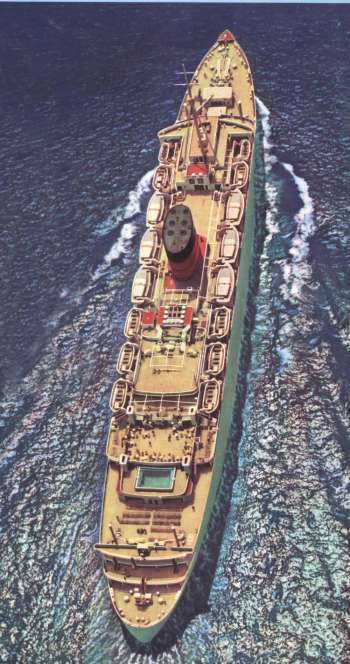 To commemorate the event, Cunard sent Caronia on a celebratory cruise which lasted 37 days and reached from Scandinavia to Africa and then back to England. As a Cunard promotional brochure described it, it was "a truly once-in-a-lifetime European holiday, arriving in England just in time for the pageantry of Coronation and the celebration of the Queen’s birthday, including preferred seats for the Coronation Procession." 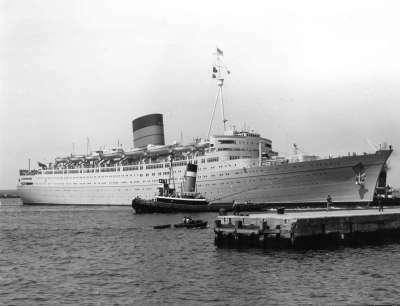 Like all her cruises, the Coronation Cruise of Caronia was priced so that only the affluent could afford it. Suites for this special voyage were $12,000 in 1953 dollars. Sadly, despite her great success in the early years, the end came quickly for Caronia. 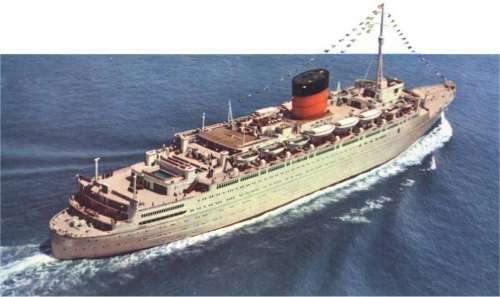 Because of Cunard’s mounting cash problems in the late 1960s and the increasing competition in the cruise market, Caronia was put up for sale in 1967. Purchased by Greek shipping magnate Andrew Kostantinides, the ship was renamed Columbia and then Caribia. Hastily refitted, the old Caronia was sent on a couple disastrous cruises out of New York. Following this, the ship sat at her pier for five years. The situation was grim. In a bit of black humor, the city of New York eventually gave the ship a parking ticket. After an auction of her interior fittings, Caronia left New York in April, 1974, shepherded by an ocean-going tug. Having been sold to a Taiwanese scrap firm, it was her final voyage. The passage as far as the Hawaiian Islands was uneventful, but somewhere near Honolulu, a small leak developed. It was thought to be negligible so the voyage continued. Trying to avoid a tropical storm, the tug lost control of Caronia just off the entrance to Guam’s harbor. The ship ran aground on the rocks near the breakwater, rapidly breaking into three pieces. In just a few short months, she had been dismantled where she lay. Thus, in an ocean she had cruised on many happy voyages, ended the life of one of Cunard’s greatest liners, the RMS Caronia. 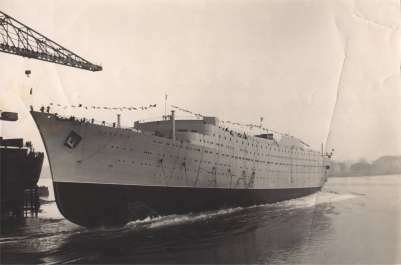 Rare Cunard White Star press photo of Caronia's launch. Caronia cruising in the 1950s. Caronia departing Ocean Dock, Southampton. Sources: Bill Miller's The Last Atlantic Liners, and various Cunard Company brochures from the author's collection. Thanks should go to Jeff Newman for space on his servers. Special thanks to Mike Choi for editing assistance and advice. Find an error? Have an idea or suggestion? I would like to hear about it, send me an email. Copyright 2002 by Brian Hawley. All materials published here are from the Brian Hawley collection unless otherwise noted. This site and its related contents are published strictly for educational purposes. Do not steal the images from this site for your own web projects! If you ask nicely I will be glad to share images as long as proper credit is given.